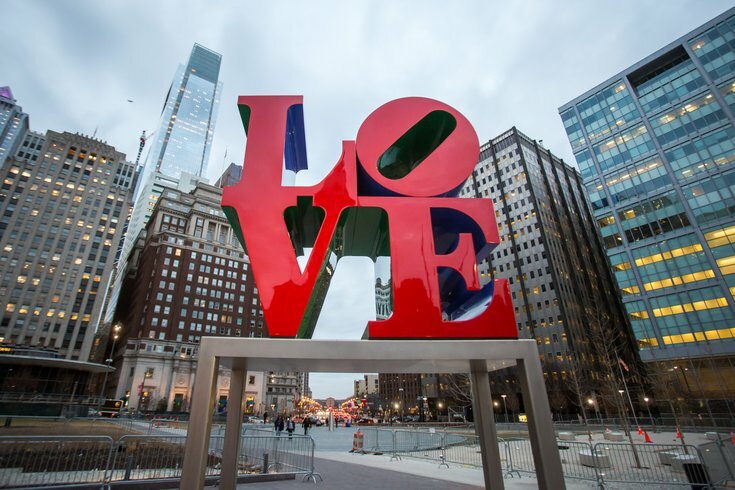 The designer of Philadelphia's most famous sculpture, the LOVE statue that graces the park of the same name, died last weekend at the age of 89, according to an obituary published Monday by The New York Times. Robert Indiana, born Robert Clark, was among the world's foremost Pop artists specializing in silk screen prints and COR-TEN steel sculptures. He reportedly died of respiratory failure. The origin of the "LOVE" image came in the form of a Christmas gift card that Indiana was asked to design for the Museum of Modern Art. The bold and capitalized lettering was later used for a United States Postal Service stamp that debuted on Valentine's Day in 1973 and remains one of the most widely used holiday stamps in the country. Inspired by a variety of spiritual influences, the "LOVE" design made its way to Philadelphia in part because of its Quaker themes of openness and inclusion. While the original sculpture first appeared in 1970 at the Indianapolis Museum of Art, the design gained enduring recognition for its placement at Philadelphia's John F. Kennedy Plaza, aka LOVE Park, during the 1976 Bicentennial celebration. Dozens of "LOVE" sculptures now appear in cities around the world in multiple languages. Ironically, Indiana reportedly remarked throughout his later life that the "LOVE" design had a detrimental effect on his reputation in the art world. He thought it reduced him to a single work and overshadowed an otherwise varied and critically praised collection of prints and sculptures. The Philadelphia sculpture was temporarily removed and temporarily stationed at Dilworth Park when LOVE Park closed in early 2016 to undergo a massive renovation. The new park debuted earlier this month after the statue was refurbished and returned to its original home.